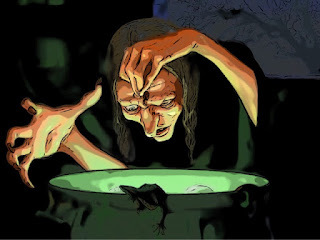 The Wicked Witch of the North set off a Witching Hour firestorm last night at the annual Witching Hour festival in Spell Willows when her right breast was bared during the nationally televised opening ceremonies, which she performed with the wicked witches of the south, east and west. The northern oldie was casting her big spell at about 12:10 a.m. in the Black Cauldron Encampment so that she and her sisters could transport monsters out of our dimension and into the human world for the Halloween season when she tossed a toad into her cauldron and lost her gown in a whirlwind of fiery witch magic. She later apologized for the incident and laid blame on her gown designer, Edith Headless. The Witching Hour festival began at around 11:30 last night when North and the other witches opened the portals to the human world. At midnight, they began casting spells around their cauldrons and were inviting The Original Mummy up to the main portal for the ceremonial first transportation. That’s when North tossed that warty toad into her brew and her gown fell to the ground. Even mass mutilators, whom you’d think have seen it all, were shielding their eyes in great pain. North got the gown back on quickly, but the split–second exposure, witnessed by up to 100 million viewers, including those who were watching on their TV sets from their castles, tombs and haunted mansions, was enough to cause uproar. “Ouwwww!” cried a pack of werewolves who were waiting their turn to be transported last night. But most monsters that witnessed the unveiling were upset. The Transyl-vein-ia TV switchboard was flooded with angry calls. After a bit of chaos, the Witching Hour ceremonies eventually continued, the Original Mummy was sent off to the Human world, and other monsters were quick to follow. North said she’d address the matter by turning her gown designer into a bug. Transyl-vein-ia TV officials said they’d put live presentations on a delay next time so that they’d have a chance to black out the broadcast if something like that were to happen again. The festival will continue throughout the week as a record number of monsters are expected to travel to the human dimension to scare people for this Halloween season.